It’s in the blood. As third generation Driveway and Parking Lot Pavers, we know our trade inside and out. There is little that our team of professionally trained pavers doesn’t know about the paving industry. And we’re here to make sure you get the quality of work and service that you deserve. In operation for over 25 years, integrity, quality, customer service, and attention to detail form the cornerstones of Willy Hicks Paving. 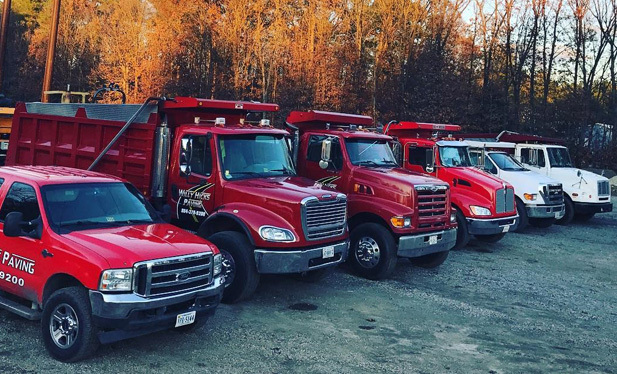 With numerous satisfied customers all over Chesterfield, Richmond, Powhatan, Goochland, Cumberland, Buckingham, Hanover, Prince George, Petersburg, Dinwiddie, Charles City, New Kent and beyond, we have developed a reputation of being the best in the business. With Willy Hicks Paving, your driveway can look great and provide longevity well beyond expectation. The driveway is what your guests see first when they arrive at your home or property. We cater to both residential and commercial driveways, utilizing our know-how to adapt our service for the paving that suits your situation. Our paving is durable and robust, able to take whatever is thrown at it. Even under heavy foot or vehicle traffic, our paving lasts. It looks great and works better. Parking lots should be expected to last under wear and tear. Enjoy years of use with Willy Hicks’ parking lot paving services. We know how the expected traffic load will change the construction of your lot, and how to address any problems posed by the type of soil that your lot will cover. With Willy Hicks Paving, your parking lot will be laid by a professional team of experienced construction workers who specialize in paving. Their intimate knowledge of paving provides you with an efficient and affordable service. Having worked with numerous commercial and residential clients, we have been involved in the paving a countless number of roads and roadways around the state of Virginia. Our technology-led approach enables us to be exact and thorough in our work, ensuring road measurements and applications are correct throughout the entire length of road we are laying. If you are looking for an elite paving company that provides only the highest quality, and economical services, call Willy Hicks Paving today. Bring your asphalt back to life with our repair and patching service.Our fast and reliable service guarantees a surface that is quickly ready to use again. Our services are ideal for any number of paving surfaces including parking lots, runways, roads, or driveways and are able to repair damage no matter how large or small. When it comes to asphalt repair and patching, we’re experts in the field. There’s not been a challenge that could beat us yet! Call us to find out what we could do for your damaged paving. When clients require an area to be paved that will be used for industrial work or will require heavy load bearing abilities, we always suggest concrete paving. Concrete paving is able to withstand greater weight stresses than asphalt. Offering a smoother finish than asphalt, concrete is also a popular choice for walkway areas, where visitors need to be able to move freely. Willy Hicks Paving lays concrete that is built to withstand the test of time. Contact us now to see what our concrete paving can do for you. We are equipped and experienced in Driveway Paving and Parking Lot Paving to give you exactly what you are looking for. Mr. Hicks is an honest individual with whom you can trust for you asphalt paving needs. He did an outstanding job on our driveway and went above and beyond our expectations. I'm very pleased and will recommend you. The price was fantastic and the finished product was excellent. I'm very pleased with Willy's professionalism and the driveway is exactly what I wanted. In an industry rife with carelessness and indifference, Mr. Hicks represents a notable exception: he is conscientious, trustworthy, punctual, and a truly gifted craftsman.